Isipharma Dermatologie, specialist in cutaneous homeostasis and in the service of dermatology since its foundation in 1987, has extended its Geneskin® range with three products presented in a Virospack full dropper pack. Geneskin is a complete skincare range comprising of 5 products that target the origins of skin ageing and help the skin recover its natural balance. The cosmetic products are manufactured in Lyon, France, in strict conformity with French and European Union regulations. They are subjected to rigorous dermatological testing, and formulated with innovative ingredients selected for proven efficiency. The cosmetics are presented in a packaging manufactured and decorated in virospack, in Barcelona, Spain, for a perfect dosage with precise and safe application, and a high quality finished look. 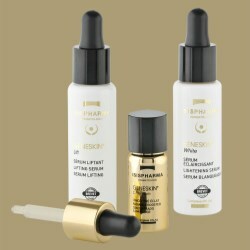 Geneskin Lift – Lifting Serum, is a concentrated formulation of hyaluronic acid (with high and low molecular weight), boosts moisture, smooths and reinforces the skin. Wrinkles are reduced and the skin is plumped. Faithful to the brief and the position of the brand, the product is presented to offer a dermocosmetic image of quality. The pack consists of a 28ml tubular glass bottle that is painted in opaque white and decorated with gold hot stamping and black screen printing, and a classic bulb dropper in black. Geneskin White – Lightening Serum, simultaneously acts on both skin tone uniformity and pigmentation marks, thanks to its lightening action. Marks are diminished and the skin recovers its uniformity. 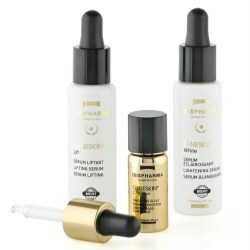 The full pack by Virospack, is identical to that of Geneskin Lift Lifting Serum. Geneskin C Premium – Radiance Booster offers a powerful antioxidant protection thanks to the synergistic action of vitamin C and vitamin E, which protect the skin from free radicals and prevent skin ageing. It instantly improves the skin, providing a bright and radiant complexion. Due to its high concentration in vitamin C, Geniskin C Premium is presented in a 10ml bottle with a compression cap, along with a luxury dropper. It is a premium presentation and at the same time cosmeceutical, which in addition to being visually appealing, ensures the stability of the formula until its use. 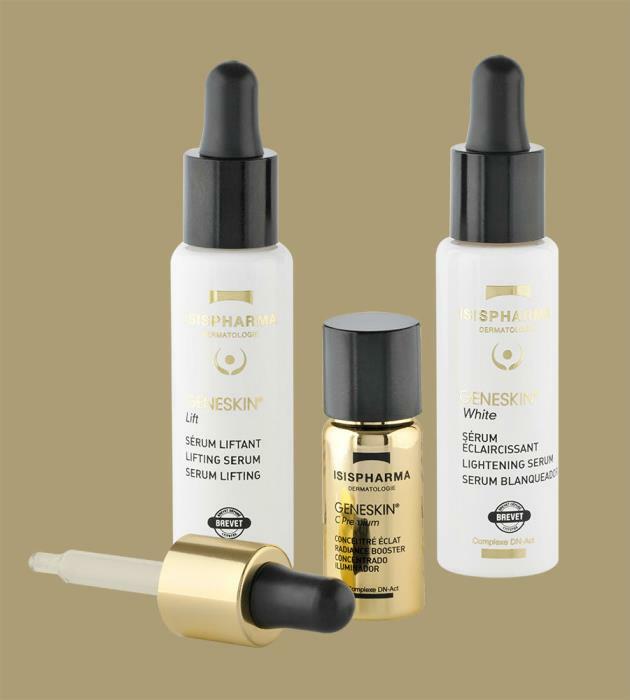 The vial is gold metallized with black printing for a quality and luxury image. In addition to the black cap, the pack is complemented by a dropper with a black rubber bulb and a gold aluminium collar overshell. Once opened, the dropper provides perfect dispensing applicator which is the ideal for a highly concentrated product such as Geniskin C Premium. Geneskin is a full range, with a high quality image, for the correction and care of skin thanks to is anti-aging properties. Its effective formulas are preserved and applied in the most accurate, comfortable and safe form, in a full dropper pack by Virospack.